Peanut butter, butterscotch and chocolate! What more could you want in an Easter treat? 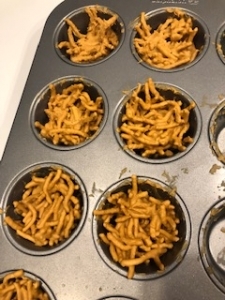 Haystacks are delicious and easy to make, but this was my first time trying them out! 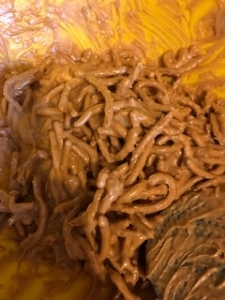 All you need are crunchy chow mein noodles, butterscotch chips and peanut butter for this recipe! 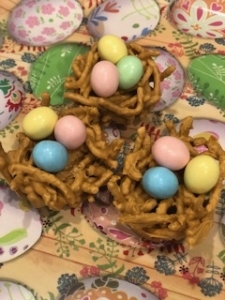 I also used little Easter egg chocolates for on top, so they’d look like bird nests! 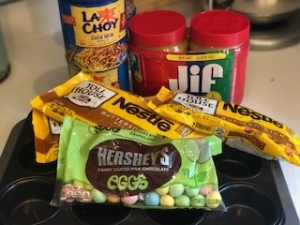 For this recipe I used a muffin tin, so they were all the same size. This is a no bake recipe, which makes it even easier. 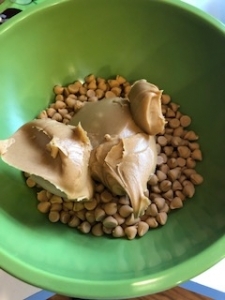 Start by adding a cup of peanut butter and a bag of butterscotch chips, then melt in the microwave– 2-3 times at 30 second intervals. 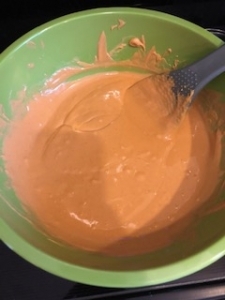 Stir melted mixture. 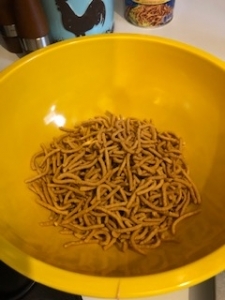 In another bowl, pour your peanut butter and butterscotch over 4 cups of chow mein noodles. Gentle mix so your noodles are evenly covered. Then, spoon into a muffin pan and let sit until it hardens. You can put it in the refrigerator, too. Add three colorful chocolate eggs on top and ENJOY! Born and raised in Louisville Ky. with a huge group of family and friends still there! Go back at least twice a year for epic parties! Schooled at Fairdale High and Morehead St. University where I majored in Speech/Theatre and Radio/Television. Taught Theatre and English at Valley High School in Louisville for a year then moved to New York City for 15 years where I’m eternally grateful nobody had smart phones for evidence! Moved to Frederick in ’92 and have worked in Radio ever since. My son Samuel Martin is my pride and joy! Frederick has the finest people and is the best place to live in America! You are my family and I love you all! Dianah Gibson’s broadcasting career has come full circle and she couldn’t be happier! Since 2007, she has been on WFRE’s morning show. Dianah was raised in Frederick County and graduated from Middletown High School. She attended Frederick Community College, Towson University, and received her broadcast meteorology certification from Mississippi State University. Dianah started her broadcasting career in Frederick. She has worked in Radio and TV in Baltimore, Washington DC, and the Virginia Beach-Norfolk area. She has appeared in several movies and numerous television commercials. But Dianah says the job she loves best is being a mother to her children, Lexi and Danny!